Map of France's Cabardes, Crobieres, Cotes Malepere, Coteaux du Languedoc, Fitou, Lomoux, and Minervois wine regions. 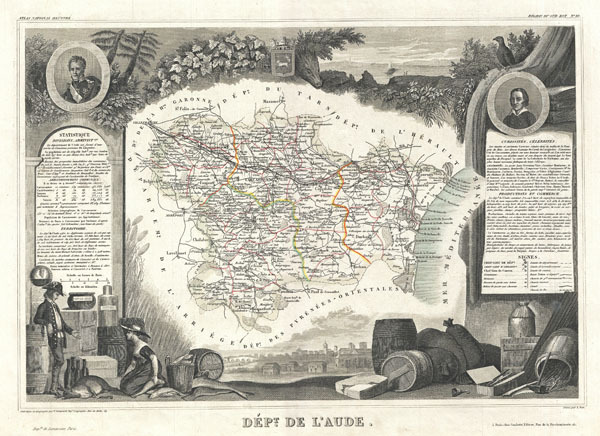 This is a fascinating 1857 map of the French department of Aude, France. This area of France is famous for its wide variety of vineyards and wine production. In the east are the wines of Corbieres and la Clape, in the center are Minervois and Côtes de Malpeyre, and in the south, blanquette de Limoux. The whole is surrounded by elaborate decorative engravings designed to illustrate both the natural beauty and trade richness of the land. There is a short textual history of the regions depicted on both the left and right sides of the map. Published by V. Levasseur in the 1852 edition of his Atlas National de la France Illustree. Levassuer, V., Atlas National Illustre des 86 Departments et des Possessions de La France Divise par Arrondissements, Cantons et Communea avec La Trace de Toutes Les Routes, Chemins,de fer et Canaux., 1852 edition.